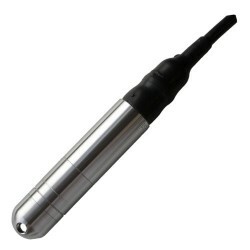 Low cost stainless steel 316L submersible water level sensor with silicon strain gauge technology for measuring utility manhole vaults over a 0 to 4 mH2O gauge hydrostatic pressure range and sending out a ratiometric 0.5 to 4.5 volts signal. This configuration of the IMSL is wired to liquid level monitoring & control instrumentation using a 5 metres length of PUR coated cable which is joined to the probes stainless steel 316L body via a waterproof seal assembly, which is IP68 rated for continuous submersion down to a maximum water depth of 100 metres. 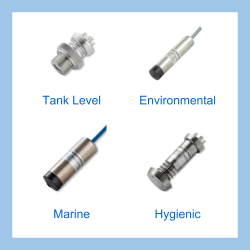 This stainless steel 316L housing version of the IMSL submersible liquid level sensor has a silicon based diaphragm sensing module with semiconductor strain gauges mounted inside a dielectric oil filled stainless steel capsule fitted with a thin isolation diaphragm. Silicon based semiconductor strain gauge pressure sensors produce very high gain and precision output signals with low hysteresis and good long term calibration stability. The silicon sensor capsule & electronics are enclosed within a stainless steel 316L cylindrical housing and the IP68 water tight seal is provided by a series of Viton elastomer O rings. The measurement accuracy is +/-0.1% FS best straight line at ambient temperature, with an additional thermal zero shift error of 0.02% FS/°C and thermal span shift error of 0.01% FS/°C. Please complete form below to request a quote for Utility manhole vault 4mH2Og range 0.5-4.5V out water level sensor. Send us your enquiry for Utility manhole vault 4mH2Og range 0.5-4.5V out water level sensor to get assistance with this product type.